Access to agricultural markets and marketing information are essential factors in promoting competitive markets and improving agricultural sector development. The agricultural sector employs majorities in developing countries and contributes greatly to its development. Unluckily, majorities of the farmers are smallholders living in rural areas and thus, lack appropriate access to markets for their products and also, they are deprived of agricultural market information. As results, farmers are exploited by middlemen who offer low prices for their agricultural produce. This study presents the best way for the agricultural stakeholders to obtain easily agricultural market information service. This study presents a novel agricultural market information system which was implemented using some concepts of crowdsourcing. Crowdsourcing allows sellers to broadcast whatever produce they want to sell and customers are allowed to submit their requests using either SMS or web. Agricultural information interacts with and influences agricultural productivity in a variety of ways. It can help to inform decisions regarding land use, labour, capital investment and farm management. Agricultural productivity can arguably be improved by relevant, reliable and useful information and knowledge (Barakabitze et al., 2015). Hence, the creation of agricultural information (by extension services, research, education programs and others) is essential to organizations that facilitate the collection and dissemination of such information to farmers who in-turn can exploit the market potentials, thereby managing the continuous changes in the agricultural production system. Therefore, there is a need to understand the functions and use of agricultural information systems (particularly agricultural market information systems) in order to improve these systems using emerging technologies as well as techniques for sourcing and advertising agricultural produce in markets (Demiryurek et al., 2008). Crowdsourcing for marketing information is one of the novel techniques in marketing. Gatautis and Vitkauskaite (2014) define marketing as “a process dedicated to relations with customers’ establishment, facilitating exchanges and leading to both sides satisfaction”. According to Lui (2007), different ways of marketing products include face-to-face marketing, virtual world, online marketing and crowdsourcing. Each of the mentioned approaches in marketing has its own advantages and disadvantages. Crowdsourcing platform in marketing is more advantageous since it can be integrated into all functions of the marketing. It can be used to involve customers from product design, product development, product advertisement, promotion and marketing (Lui, 2007; Whitla, 2009). 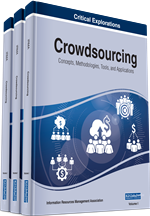 Thus, crowdsourcing can change the market configurations as well as change how end users (i.e. customers) are involved during the development of a product or good to be sold in markets.